Watch Chris cover the Mississippi Sheiks song Sittin’ on Top of the World. “I learned it 50 years ago and I just thought to myself, ‘I should slow this down because it’s not really a happy song,” he says. 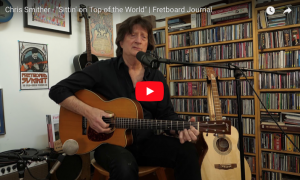 Watch the video, or listen to the full Fretboard Journal interview with Chris.